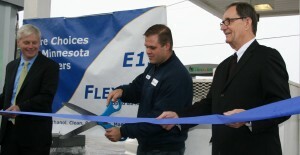 The ribbon was cut on new flex fuel pumps that dispense E15 and E30 at Penn Minnoco in south Minneapolis this week. Did you miss the news that E15 is now available in Minnesota? Have you been hiding under a rock? If you have been under a rock, please come out and catch up on the great news Minnesota motorists received this week. The higher ethanol blends E15 and E30 are now available in Minnesota — giving drivers more choices at the pump and a lower cost and renewable alternative to unleaded gasoline. Click here to view the WCCO live reporte from Bill Hudson.